Conflict inhibits work flow infecting the system, disturbing peace in the office and can be responsible, depending on the size of your company, for up to 19% of the total costs. Do not get mad about conflicts. They are part of your daily business, just like a paper jam in the office printer always happening when nobody has time for it. You either know how the printer works and repair it yourself or you call a technician. You should handle conflicts in exactly the same way. That is only one reason to invest in professional help offered by a mediator when conflicts occur. 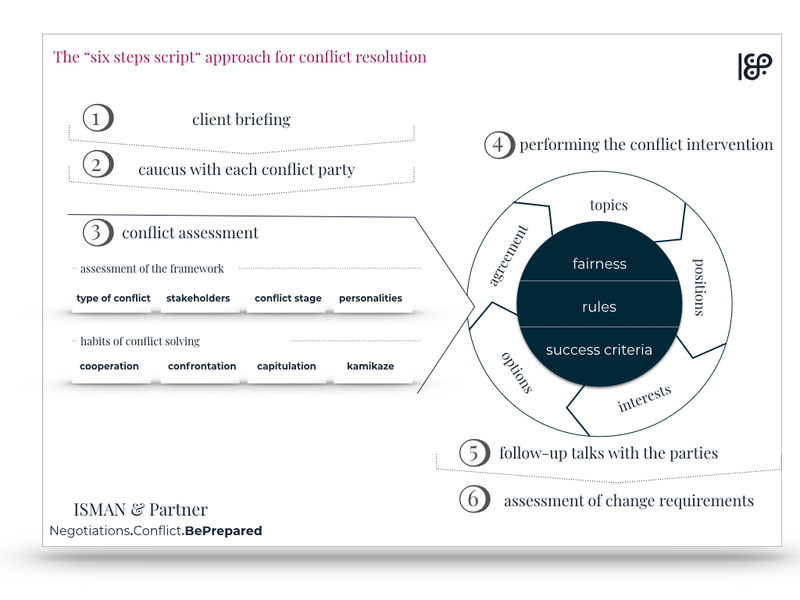 These mediation concepts all uncover the often sought after “opportunity of the crisis”: if you solve conflict in a lasting manner you show that you take the problems of your employees seriously and they will honour this. You strengthen the confidence, contentment and sense of responsibility of your employees. Also, during collaboration with external service providers or customers, a professionally led argument can lead to a stronger commitment and a better relationship. You put a conflict on the table, but you simultaneously communicate that you value the collaboration and are willing to continue it. Employees and customers will honour your objective handling of the situation. As a side effect all involved people learn and experience new ways of handling conflicts and may be able to solve their next conflict all by themselves. Anyone who has observed the printer technician enough times can repair a paper jam. The solving of conflicts can be learned by your employees. The cause of conflicts is, by the way, not always between people, but also in the underlying systems, structures and processes. If you want to, we can get to know each other noncommittally and you tell me about your problem in a confidential conversation.